Region: This beetle is found in the eastern portion of North America. Life cycle: The Soldier Beetle produces two generations each year. The larvae overwinter in the soil or garden trash. 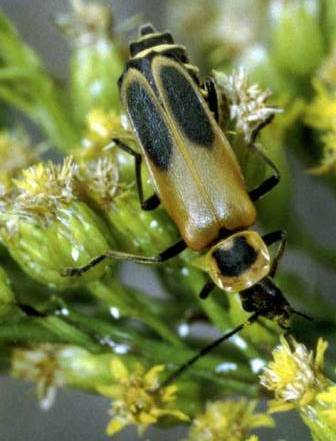 Physical description: This beetle is yellowish golden or a dull orange with a black spot on its thorax and black markings on the back of both wing covers. It has a black head, soft body, and measures 1/2 inch long. Its eggs are laid in groups or clusters in the soil, while the larva is white with a flattened body and is hairy. Feeding characteristics: The adult's diet consists of grasshopper eggs, cucumber beetles, and a variety of Caterpillars.